Pure Gold FM 94.1 & 94.3 – Welcome to the Greatest Hits of All Time as they say! Pure Gold 94.1 FM Costa Blanca brings you the best classical music sing and produced by decade defining artists. Listeners can enjoy the golden era of The Beatles, The Beach Boys, Buddy Holly, Aretha Franklin, Rolling Stones, Elvis Presley, David Bowie, The Eagles, Elton John, Diana Ross and others. The Old is Gold Pure channel committed to play for its audiences, fantastic mix of the sounds that are evergreen, the culture which is all time favorite, and continues to influence the 21st generations. 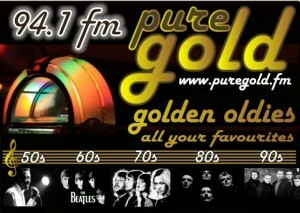 Listen Pure Gold 94.1 & 94.3 FM Costa Blanca. Wait as the stream loads. We have following live Spanish radio stations, available to listen online.